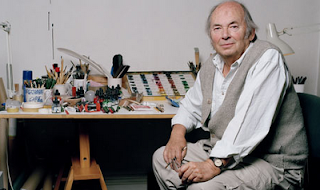 Quentin Blake was ten minutes into a chirpy monologue about who inspires him as an illustrator when something occurred to me: with his small, bird-like features, wispy hair and lively eyebrows, he looked not a little like the people he draws (self-portrait, above; portrait, below by Eamonn McCabe). I cast my eyes across the rest of the panel taking part in the talk at the British Library –illustrators and cartoonists, Posy Simmonds, Martin Rowson and Jamie Hewlett. 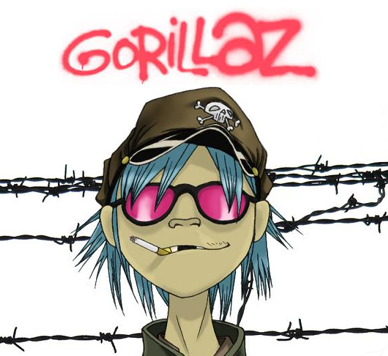 Simmonds had the soft, open features and grace of her Tamara Drewe and Gemma Bovary characters; Hewlett, the cheeky, boyish grin of the Gorillaz crew, below (and see him speak briefly here). Do people who spend their lives creating other people turn to the most obvious person for inspiration – themselves – even if it's subconscious? My theory, of course, ended with Rowson, a brilliant "visual journalist" whose intricate, political cartoons resemble modern-day Hogarth but look nothing like him. Hey ho. I adored Blake as a child, never sure if it was his drawings, or Roald Dahl's words, that I loved best. 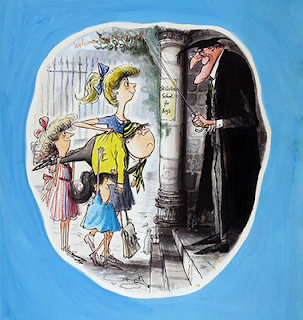 So it was fascinating to discover who inspired him: turns out, he was not alone in his idolatry of Ronald Searle, who died last December (below). "The Godfather," said Blake. "He had the best line," said Rowson (it's a drawing thing). "The greatest illustrator of all time," said Hewlett. "He has completely inspired me all my life." 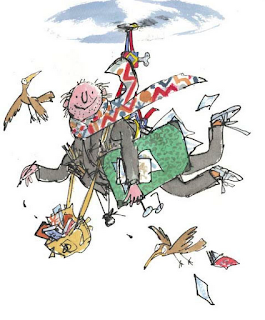 Hewlett, Blake, Simmonds and Rowson were intelligent, funny and generous, and gave the impression that being an illustrator is an extremely rewarding way to spend your life. It worked for Searle, too: he lived in France, with the woman he loved, and drank champagne every day. 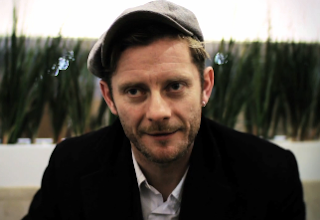 As Hewlett said: "What's not to admire?" "I didn't think I'd ever recover"